Pauline Marois and the Parti Québécois claimed victory over the incumbent Liberals on Tuesday night, winning a minority government in an election night that ended with a deadly shooting. Pauline Marois and the Parti Québécois claimed victory over the incumbent Liberals Tuesday night, winning a minority government in an election night that ended with a deadly shooting. One person died and another was critically injured after shots were fired at Montreal's Metropolis, where Marois was in the middle of her victory speech. A third victim was treated for shock in hospital. Quebec's premier-designate had just told a cheering crowd that Quebec needs to become an independent country when her bodyguards swooped in and whisked her off stage. Marois took the podium just before midnight as a gleeful crowd of supporters burst into a round of Gens du Pays, a nationalist anthem, Marois told all Quebecers she was hopeful they could put aside their differences for a united Quebec. "Voters have made a choice and we will respect it, and we will govern with all other parties at the national assembly," she told the packed room at the Metropolis concert hall. The PQ won 54 of the province's 125 seats with 31.9 per cent of the vote, while the Liberals won 50 seats with 31.2 per cent of the vote. Marois, 63, will become the province's first female premier. During her speech, Marois thanked all of the candidates in the election and said the PQ will govern with all parties represented at the national assembly. In English, Marois directly addressed anglophone Quebecers, saying their rights would be respected. "We share the same history, and I want us to shape together our common future," she said. She also addressed her "friends and neighbours in Canada" saying that Quebec needs to become sovereign. "We want a country and we will have it," Marois said to loud cheers. The PQ has never governed in the past with a minority, however, and its ability to table a referendum question or any other confidence measure would be tested by Liberal opposition. Potential support for the PQ from two members of Québec Solidaire who were elected to the national assembly would still not provide a majority. Prime Minister Stephen Harper congratulated Marois on her election win, but dismissed the prospect of Quebec sovereignty. "We don't believe Quebecers want to reopen the old constitutional quarrels of the past," Harper said. "Our government will remain focused on jobs, economic growth and good economic management. We believe economic issues and jobs are also the priority of Quebecers. In that sense, we will continue working with the government of Quebec on those common objectives." Federal interim Liberal Leader Bob Rae remarked on Twitter that "Quebec voters reject separatist project." While the minority win falls short of a majority the PQ pitched for during the campaign, it marks a significant loss for the Liberals, who, after nine years in power, gambled on a summer election a year before the end of their mandate. Jean Charest, the longtime premier, lost his bet that student turmoil and a soft economy would be enough to push voters to support a Liberal government for a fourth term. 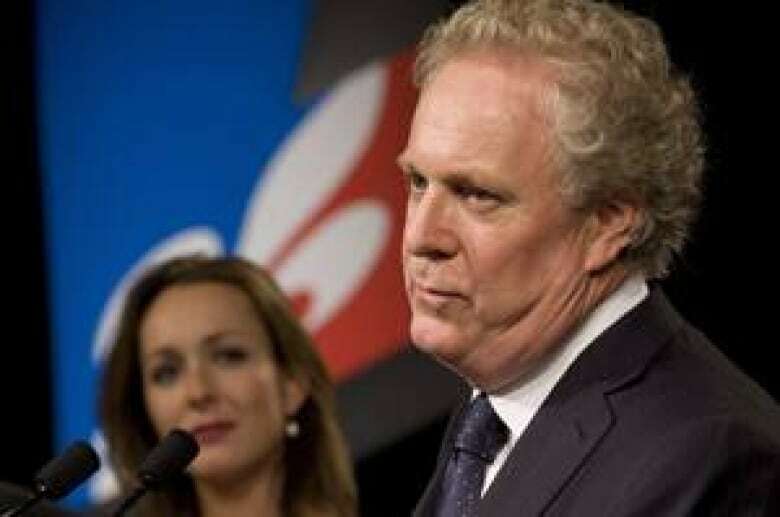 In his own riding of Sherbrooke, Charest lost to PQ candidate Serge Cardin, a former Bloc Québécois MP. With a hoarse voice, Charest conceded defeat to a crowd gathered in his home riding, alongside his wife and family. "This is not the result I would have wanted. This is not a battle that I backed away from. I now have the firm conviction that our party will continue to serve Quebec, and will do it together." Charest pointed to the PQ's failure to gain a majority, saying the campaign results show that the "future of Quebec lies within Canada." He took responsibility for the Liberal loss, saying he did so with an "open heart." "I tell you at the same time, there will be other chances for the Quebec Liberal Party," he said. "We have work to do. We proposed things to Quebecers, and now, faced with a minority government, we will be able to make our own contribution to the further construction of Quebec." Charest will likely consult his caucus before deciding on his future, according to a former cabinet minister and close ally. Monique Gagnon-Tremblay said Charest is scheduled to meet his cabinet Wednesday and then his caucus later in the week. In her victory speech, Marois told the crowd they should salute Charest who held a "demanding" job for nine years. The newly formed Coalition Avenir Québec, in its first appearance in an provincial election, had a good showing, coming in third with 19 seats. "The political landscape of Quebec will never be the same," CAQ Leader François Legault told a crowd gathered in Repentigny. "We will see a new political force rise in Quebec. We can be proud of the road travelled in the last year." Legault won his riding of l'Assomption in a down-to-the-wire race against his nearest opponent, the PQ's Lizabel Nitoi. Québec Solidaire won two seats, one each for its co-spokespeople. Françoise David marked her first win in the Gouin riding, defeating PQ MNA Nicolas Girard, who had held the seat since 2004. To a standing-room crowd at Montreal's Olympia Theatre, David thanked voters for believing in the party. "Thank you for expressing a profound desire for a feminist, ecologist and sovereigntist change," she said. The former president of the Quebec federation of women congratulated Marois on her historic achievement as the first woman to lead Quebec's government. Amir Khadir, the party's other spokesperson and sole QS MNA when the national assembly was dissolved, has also been re-elected in the Montreal riding of Mercier. Jean-Martin Aussant, leader of the Option Nationale, lost to the CAQ candidate Donald Martel in the Nicolet-Bécancour riding. Aussant previously held the same riding for the PQ before he left the party in 2011. While all eyes were on the party leaders, the spotlight was also shining on several key candidates. Former student leader and PQ candidate Léo Bureau-Blouin won the riding of Laval-des-Rapides, defeating the Liberal incumbent Alan Paquet and CAQ's star challenger Maud Cohen. Jacques Duchesneau, former head of the province's anti-corruption squad and high-profile CAQ candidate, won his race in St-Jérôme. Four cabinet ministers — Pierre Corbeil, Clément Gignac, Alain Paquet and Serge Simard — were all defeated. All four lost their seats to PQ challengers. This campaign wasn’t a walk in the park for any party, with all leaders traversing the province and revving up the engines of their get-out-the-vote machine until its dying hours. The Liberals were in a fight for their political lives since the campaign's very first day. The PQ and the upstart CAQ were quick to try to claim an advantage by highlighting the Liberal record on economic issues, the continuing corruption inquiry into the construction industry and the government’s handling of the tuition crisis and resulting civil unrest last spring. Voters elected 125 representatives to form the legislature’s 40th national assembly. Sixty-three seats were required to form a majority government.